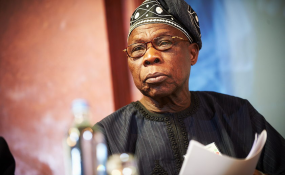 Abuja — Former President, Chief Olusegun Obasanjo, Wednesday lampooned the President Muhammadu Buhari led administration, saying that the government is at the moment confused in addressing the mirage of problems and challenges confronting Nigeria as a country, just as he warned that if serious action was not taken, they would be the death knell to the country's democracy. According to Obasanjo, the Buhari government has gotten to the end of its tethers and the nation at present is being left divisively and perilously to drift. Speaking in Abuja as the Special Guest at a one- day Extra Ordinary Summit of Leaders and Elders of Nigeria convened by the Northern Elders Forum (NEF), Afenifere, Ohaeneze Ndigbo, Pan Niger Delta Forum, the former President while taking a swipe at the government, said that Nigeria, in recent times, has not been so divided along religious and regional lines as at today with what he termed, inexcusable killings and devastating poverty and with government's wringing hands and apparently incompetent to stern the tide except giving one unrighteous and unacceptable justification after the other.